Store-bought coconut flour can be expensive. Learn how to make coconut flour at home. It’s easy & you’ll save money. Use it for cooking and baking recipes. Have you tried baking or cooking with coconut flour yet? Those who are Paleo, gluten free or grain free often opt for coconut flour (along with nut flours) for baking and cooking. Keep in mind with baking you can’t use a 1:1 ratio to wheat flour. Generally, you will use about 1/4 of the amount and a lot of eggs as coconut flour is very dense and dry. If you’re new to baking and cooking with coconut flour, check out my top 100+ coconut flour recipes to get started. Okay, so back to basics. Who’s ready to learn how to make coconut flour? It’s really easy. Like really, really easy. First, you’ll need coconut pulp. You can get this from fresh coconuts or dried coconut flakes. I like to make my own coconut milk first with this pulp and then use what’s leftover to make coconut flour, so there’s no waste – and I get coconut milk out of it. After you follow my recipe to make coconut milk, then you can make coconut flour. Did you try this recipe for how to make coconut flour? Don’t forget to rate the recipe and comment below to let me know how it went. You can also FOLLOW ME on Facebook, Instagram and Pinterest to see what other fun things I’m getting up to. Store-bought coconut flour can be expensive. Learn how to make coconut flour at home. It's easy & you'll save money. Use it for cooking and baking recipes. Heat oven to 120°F (50°C). Spread out coconut pulp on parchment paper and bake for 45 minutes or until the coconut pulp is dried (no moisture at all). Blend coconut pulp in a Vitamix or food processor for 1-2 minutes until pulp becomes a fine powder. Store coconut flour in an air-tight container. Like this blog post? Pin it and share it! P.S Looking for tips to transition to a real food or healthy gluten-free lifestyle? 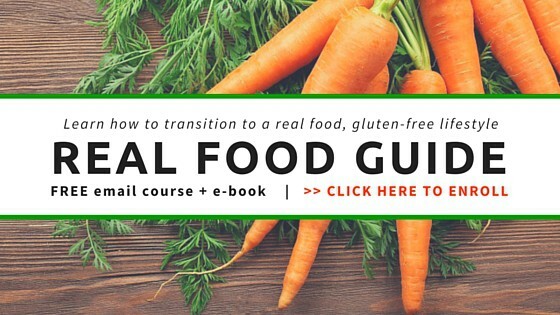 Check out my free Real Food Guide email course and e-book. My oven only goes to 170 degrees Fahrenheit. Any suggestions on how to dry at that temp? I had no clue how easy it was to make coconut flour, can’t wait to try it! Do you know the shelf life of homemade coconut flour? You can keep it in the freezer for about 6 monhts. i tried to make coconut flour from pulp in vitamix but i got shredded coconut not flour like consistency…super fine like the rice or millet flour i made…what went wrong?? ?i let it cool from oven and i used 4cups in 64oz container each time…..ia m so sad.. It could be that the fat from the coconut milk was completely removed, so what’s left in the pulp was too grainy to make into a coconut flour. I suggest using a bit of that pulp (maybe a few spoonfuls) and mix in with a cup of coconut flour and blend to see if it gives you the consistency you want. I came here to find out how yo mske coconut flour. (Just made almond flour). People will be smazed how truly simple it is. Thanks, Rose?